San Patricio Overlook has 0.15 miles of shoreline to fish from and 1.5 acres to explore. The San Patricio is located approximately 16 miles north of the intersection of La. Hwy 191 and La. Hwy 6. 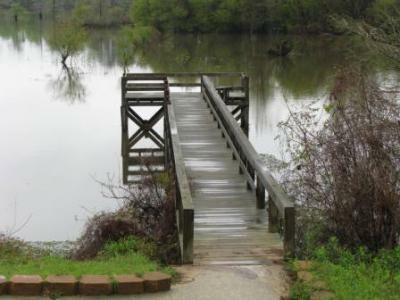 San Patricio offers a handicapped accessible fishing pier, benches and picnic tables for your convenience. This is a beautiful site for picnicking, fishing or just watching the sun set in this tranquil atmosphere. Directions: San Patricio is located on Highway 191, 0.2 miles north of the junction where Highway 1218 intersects Highway 191. It is on the west side of the highway.